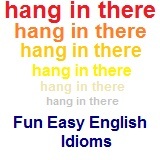 ﻿ Fun Easy English - new american english idioms letter r.
In this lesson you will learn American English idioms beginning with the letter R. You will learn the definition and study the usage of each idiom. RACK (ONE’S) BRAIN(S) to search through one’s mind intensively; to try very hard to think of something 1. I’ve been racking my brains, but I just can’t remember where I know that person from. 2. When John saw the exam questions, he knew he wasn’t prepared. He racked his brain for the answers, but he couldn’t come up with anything useful. rain check free ticket He received a rain check to the baseball game after it was cancelled because of the rain. rain check permission The store gave her a rain check to purchase the product for the same price at a later date since it was sold out today. RAINING CATS AND DOGS to rain very heavily 1. The children should take their raincoats, umbrellas, and boots—it’s raining cats and dogs. The expression suggests that spoiling someone’s happy feelings is similar to having it rain during a parade. The expression is usually used in the negative. 1. They’re feeling so good today; nothing could rain on their parade and spoil the way they feel. 2. I’m in a great mood, so don’t tell me anything that might change the way I’m feeling. Don’t rain on my parade. raise a fuss complain The woman at the restaurant chose to raise a fuss when her meal arrived late. raise a hand do something She will never raise a hand to help her friends. The word Cain in the expression refers to a Biblical character, the first son of Adam and Eve, who killed his brother Abel. 1. The citizens were unhappy with the way the city council was running the government. They mounted a protest and raised Cain at the next city council meeting to let their feelings be known. 2. Mr. Ward found that his sons had used his tools and left them all over the garage floor. He raised Cain when he saw the boys and told them they couldn’t use the tools again. 3. Quit raising Cain! I know you’re angry about the change in our plans, but there is nothing we can do about it. raise eyebrows cause surprise These crazy clothes should raise eyebrows at the office tomorrow. rake in the money make a lot of money She should be able to rake in the money with that new product. Compare to: call (someone) on the carpet; give someone a piece of (one’s) mind; lay down the law Rake someone over the coals is more severe than call someone on the carpet. 1. The bank teller stood silently in the manager’s office while she raked him over the coals for the errors he had made that day. 2. The principal discovered who was responsible for the vandalism at the school. He called them into his office and raked them over the coals. The expression comes from the military formation of soldiers side by side (rank) and one behind the other (file) forming large groups such as platoons. The expression has come to be applied to the non-management workers in a union (sentence 1) or company (sentence 2). 1. The union asked its rank-and-file members to vote against the new contract that the company was offering. 2. Ted is getting promoted from the rank and file to a position in middle management. He hasn’t had much schooling, but his years among the workers have taught him enough to work his way up. ran out of gas lost momentum The politician ran out of gas during the campaign. Compare to: read something into (something). The expression suggests that there is meaning hidden between the lines of the words actually written. 1. Although James didn’t say it in so many words, Elizabeth could read between the lines that he didn’t want to see her again. The expression originates from the Riot Act of 1716, in which King George I of England decreed that it was unlawful for twelve or more people to assemble in order to protest or act in a ‘disruptive’ manner. When such an assembly took place, a person of authority was directed to read the Riot Act to the crowd in order to disperse them. Anyone refusing to disperse after the reading could then be arrested. 1. When the girls arrived home several hours late, their mother read them the riot act. The expression suggests that one can see meaning in some action or something said or written that is not actually there. 1. Let me tell you what Scott said to me and then tell me how you would interpret it. Am I reading more into it than I should? 2. When the lifeguard passed by and said hello to the young girl, she was convinced that he was in love with her. She was reading something into his hello that wasn’t there, because he said hello to everyone. REAL MCCOY, THE the genuine article; not an imitation or substitute 1. When Mark asked Diana what kind of engagement ring she wanted, she said she didn’t want an imitation diamond. She wanted the real McCoy. 2. You have to be careful when you go shopping in some places in Europe. Tourists buy a lot of items like watches and purses that supposedly are famous brands, but they aren’t the real McCoy. ream someone out yell at him The boss decided to ream him out for his bad report. The expression originates from the fact that a red (smoked) herring has a powerful and persistent odor. Centuries ago red herring was used to train dogs to track scents. Those hoping to misdirect tracking dogs would drag red herring across their trails since a dog that gets a whiff of red herring will lose any other scent that it has been following. This expression is often used in the context of mystery stories. 1. The newspaper reporters were hot on the trail of a good news story. The man they were pursuing didn’t want to be caught, so he tried to mislead them by throwing them a red herring. 2. The elected officials in congress don’t want the voting public to concentrate on the issue of higher taxes. They divert the public’s attention by constantly raising another, less important issue that is nothing more than a red herring. red ink debt The company has been in red ink from the beginning. The expression originates from the practice of marking holy days in red on some calendars. 1. Tomorrow is going to be a red letter day for our school. The president is coming to speak to the students and faculty. 2. Mike was made a vice president of the company yesterday. It certainly was a red letter day for him. RED TAPE the unnecessary paperwork and procedures of a complicated bureaucracy 1. I try never to ask the government for anything. They are so bogged down in red tape that it takes forever, it just isn’t worth the effort. 2. When my father was rushed to the hospital, the head nurse cut through all the red tape so that he could get to see a doctor immediately. REST ON (ONE’S) LAURELS to be so satisfied with what one has already accomplished that one no longer works very hard 1. David had brought a lot of money into the company in the last few months and he deserved to take it easy for a while, but he was working harder than ever. He refused to rest on his laurels. 2. Ted invented one new product that was a huge success, but that was over ten years ago. He hasn’t produced or contributed much since then—he’s been resting on his laurels. The expression rhyme or reason, which is usually used in the negative or in question form, emphasizes the total lack of apparent rationale for some behavior. The phrase originates from William Shakespeare’s play As You Like It, in which the character Orlando responds “Neither rhyme nor reason can express how much” when he is asked if he is really as much in love as his rhymes suggest. 1. Linda didn’t understand why George had done what he did, so she asked him if there was any rhyme or reason for his behavior. 2. I was walking quietly down the street when I saw this dog sitting inside its yard. Then, with no rhyme or reason, the dog jumped over the fence and bit me. For centuries bells have been rung to call people’s attention or remind them of events, such as bells ringing to announce the start of town meetings, doorbells, and even the ringing of telephone ‘bells.’ 1. Laura asked him whether he had heard of Maggie Smith, but he told her that the name didn’t ring a bell. He couldn’t recall whether he had heard of the woman before or not. 2. I’m not sure I’ll know any of the guests you’re inviting to the party, but if you read the list of names to me, some of them may ring a bell. rip off overpriced item This car was really a rip off. rip off steal Someone tried to rip off her car last night. The expression often describes a situation that becomes worse for the people involved when someone opens the situation to scrutiny. The expression suggests the idea that people who stand up or move about in a boat disturb the other passengers because the boat may capsize. It is frequently used as the negative command, “Don’t rock the boat.” 1. Unknown to the boss, many employees left work earlier than they were supposed to. They thought they had a good thing going until Bill became angry and rocked the boat by telling the boss what was going on. 2. Everyone is happy with the situation as it is. If you change it, you’ll be rocking the boat. The expression originates from the practice in which, when famous or important people are received, a red carpet is often laid for them to walk on from their carriage or car to the building they will enter. When someone is given the red-carpet treatment, he or she is treated like an extra-special person. 1. The businessmen were given the red-carpet treatment by the small town in the hopes that they would decide it was a good place to build a factory. 2. Please don’t go to any trouble for us when we come to visit. You don’t need to roll out the red carpet. Compare to: go with the flow; like water off a duck’s back 1. Adversity doesn’t seem to bother Tom. When something bad happens to him, he rolls with the punches, he makes the best of the situation and goes on. 2. In this business there are a lot of unpredictable ups and downs. One has to learn to adjust and take them as they come. One must learn to roll with the punches. The expression suggests that a person looks at something with glasses (eyes) that are not clear. Instead he uses rose (pink)colored glasses that give a falsely good view of something. 1. We admit that we’ve been seeing the situation through rose-colored glasses, and now we must face the situation and see it as it really is. 2. Parents almost always have trouble seeing their children the way the rest of the world sees them. Instead, they look at them through rose-colored glasses. rough time hard time We have had a rough time this winter. This expression refers to the imagery of getting so close to someone that your elbows touch. The term can be used in either a boasting or a negative manner. 1. Mr. and Mrs. Campbell go to a lot of fancy dinner parties where they rub elbows with some very famous people. 2. In his line of work as a criminal lawyer, Brian rubs elbows with some of the lowest levels of society. Whereas bug, get someone’s goat and get someone’s dander up can be used to describe a specific irritation or annoyance caused by either someone or something, rub someone the wrong way usually describes a clash of personalities that is more general, going beyond a single event or reason. 1. Sarah doesn’t know what it is about that man, but she just doesn’t like him. No matter what he says or does, he rubs her the wrong way. 2. I wish I could just ignore Robert’s irritating habits, but I can’t stand to be around him. He rubs me the wrong way. RULE OF THUMB a rough guide; an unwritten or customary rule based on experience or practice 1. In this company there is no written rule about how long we can take for our lunch break, but the rule of thumb has been about one hour. 2. Sometimes it’s hard to know how you are supposed to address people you are meeting for the first time. A good rule of thumb is to be formal and wait until they invite you to call them by their first names. The expression originates from the Malay word amuk, which has a similar meaning. 1. I hope the class will walk in an orderly line as we go to the other classroom. There’s no need to run amok. 2. The boys startled the sheep, and the sheep pushed down the gate to the pen and ran amok through the farm. The expression suggests someone who can move quickly around another person, leaving him dazed or sluggishly stuck in the middle. Whereas run circles around someone means to outperform someone (usually physically), head and shoulders above someone usually refers to a person’s character or inner qualities. 1. Tina is a much better tennis player than Mary. She ran circles around Mary in the tennis match yesterday. 2. I’m not very good at math and science. Most people run circles around me in those two subjects. The expression is most often used in terms of illness (sentence 1), but can also be used to describe other processes that have a predictable or established course of events. 1. The doctor told the patient that there was no medicine he could give her for her illness. He told her that she would just have to let the fever run its course. 2. There wasn’t much the police could do to stop the demonstration. Since it was peaceful, they let the demonstration run its course. The expression run of the mill originates from the idea of a product such as fabric, which was first mass produced (the run) in a mill, enabling it to be uniform. 1. That restaurant serves lots of different dishes, but none is outstanding or very much better than in any other restaurant. It’s run of the mill. 2. Ricky was an average student who liked to play sports as much as the next boy. He was your runof the mill student. run short not have enough If we don’t order supplies now, we will probably run short. Beat a dead horse means to talk about a topic or idea that cannot succeed (it’s dead), whereas run something into the ground means to talk about a topic or idea that may be viable, but to do so to excess. 1. Now that everyone is tired of listening to that idea, why don’t you stop talking about it? You have run it into the ground. 2. I’m going to push this idea with the boss until he accepts it, even if I have to run it into the ground. run the show make the decisions It seems as if the boss really likes to run the show. running off at the mouth talking too much He is always running off at the mouth. Hey do you know any English idioms beginning with the letter R not listed on this page?